British conductors don't have much of a track record when it comes to Bruckner. Perhaps Ivor Bolton is in the process of bucking the trend. This is his 5th Bruckner outing with the Mozarteumorchester Salzburg and follows recordings of the 5th, 3rd, 7th and 9th Symphonies. As you might expect, the orchestra clearly knows Bruckner like the backs of their hands, and I often get the feeling in this recording that Bolton is the outsider bringing, or at least attempting to bring, new perspectives to the familiar standards. He insists on keeping the tempos flexible, which gives much of this music a vitality and unpredictability that is all too rare from other conductors. But the cost is a lack of discipline, both in terms of the music's architecture and in the ensemble of the orchestra. Neither is fatal, but the lack of firm control from the podium is what separates this from the greatest Bruckner 8s, whatever interpretive insights Bolton brings. His first movement is slow, at 17.5 minutes even slower than Haitink's recent recording with the Concertgebouw. The slow pace allows Bolton to concentrate on the details, including the dotted rhythms, which are almost all played double dotted, a nod perhaps to the the shape of the opening theme. Both of the outer movements suffer from loose ensemble, which reduces the effect of many of the climaxes. Bolton often shapes phrases with some fairly extreme rubato, which sometimes works, but not always. The one place where it is really effective is in the coda of the first movement. This is the only quiet ending of an outer movement in any Bruckner symphony, and it is clearly an interpretive challenge for many conductors. Bruckner doesn't give any tempo indications here, and even though there is a dim, there is always the danger that the music is just going to stop without reaching a logical conclusion. But Bolton carefully structures this page of music. He gradually slows it down, and really focusses on the shape of each of the descending motifs in the middle strings. It is the most convincing reading of the passage I've heard, and is only slightly spoilt by a messy last chord from the strings. The Scherzo is a fairly standard reading. There are some intemperate outbursts from the brass here and there, but order is more or less maintained. The Adagio is a real treat. Bolton takes it quite fast, relatively speaking, but aims throughout for clarity of line and texture. This is in stark contrast to the opening movement, where the tempos were slower and much more variable. But as with the first movement, Bolton is clearly trying something different here, an unsentimental approach where the notes are left to speak for themselves. In the Finale we are back to the big, brash textures of the opening. If I've one complaint about the Finale it is a lack of grandeur. We get plenty of volume from the brass in the climaxes, and the build-ups are often carefully paced. But there is little sense of architecture, of the climaxes informing and punctuating the rest of the music. The orchestra are on good form, although the ensemble in the strings often leaves much to be desired. The brass have a big, warm sound in the quieter passages (excellent Wagner tubas in the Adagio) but can sound course in the louder sections. The sound quality is reasonable for a live recording, but there is little on the technical side of this disc to suggest the audiophile reputation of the OEHMS label. 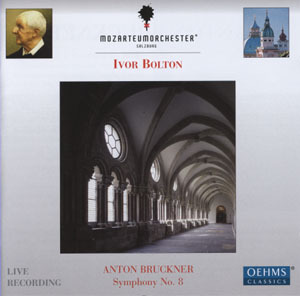 Mixed feelings, then, about Ivor Bolton's Bruckner 8. There are a few movements of staggering interpretive originality, not least the coda of the first movement and the detail in the Adagio. Bolton's variable tempos are behind many of these interpretive insights, but they are also responsible for a lack of structural logic in the outer movements and the reduced impact of many of the climaxes. Probably the best Bruckner 8 you will ever hear conducted by a Brit, although that isn't saying much.